The system of construction in concrete and brickwork introduced by the Romans was adopted by the Byzantines. The carcase of concrete and brickwork was first completed and allowed to settle before the surface sheathing of unyielding marble slabs was added, and this independence of the component parts is characteristic of Byzantine construction. Brickwork, moreover. lent itself externally to decorative caprices in patterns and banding, and internally it was suitable for covering with marble, mosaic, and fresco decoration. The Byzantines therefore took great pains in the manufacture of bricks, which were employed alike in military, ecclesiastical, and domestic architecture. The ordinary bricks were like the Roman, about an inch and a half in depth, and were laid on thick beds of mortar. This general use of brickwork necessitated special care in making mortar, which was composed of lime and sand with crushed pottery, tiles, or bricks, and much of it remains as hard as that in the best buildings of Rome, while the core of the wall was sometimes of concrete, as in the Roman period. The decorative character of external facades depended largely on the arrangement of the facing bricks, which were not always laid horizontally, but sometimes obliquely, sometimes in the form of the meander fret, sometimes in the chevron or herringbone pattern, and in many other similar designs, giving great variety to the facades. An attempt was also made to ornament the rough brick exteriors by the use of stone bands and decorative arches. Common brick: brick made for general building purposes and not specially treated for color and texture. Also called "building brick." Facing brick: brick made of special clays for facing a wall, often treated to produce the desired color and surface tension. Also called "face brick." Glazed brick: brick with a ceramic coating or finish applied then fixed in a second firing. Glazing results from the way the bricks were stacked in kilns (or temporary kilns called clamps) for firing. The headers were positioned closest to the heat source and were thusly glazed or vitrified just as a piece of clay pottery would be glazed. A brick, after all, is a ceramic. In colonial Virginia and neighboring colonies, brick kilns were normally fueled with oak. The potassium in oak produced a chemical reaction with the clay resulting in the clear blue-gray glazes on the headers, which provided a rich contrast to the red stretchers. By the mid-18th century, the stands of oak in eastern Virginia were being depleted. Hence, softer woods, such as pine, were used to fire brick kilns. Pine does not produce the light blue glazes that oak does but instead turns out smutty black headers. Black headers were not considered attractive, thus when a wall was laid up in Flemish bond, the black glazed headers were laid facing inward and the unglazed headers were exposed on the wall surface. This gave the walls an overall even color ... Rubbed bricks continued to be used at jambs and corners but the color contrast was not as strong. Glazed-header Flemish bond continued to be used in well into the 18th century. However, Philadelphia headers tend to be black Carpenters’ Hall, built 1770-73. Regrettably, much of Philadelphia’s 18th-century brickwork was irreparably damaged by sandblasting during the city’s extensive restorations of the 1960s and ‘70s. Carpenters’ Hall fortunately was spared this misguided disfiguring; its brick surfaces and mortar joints remain in good condition. The use of Flemish bond experienced resurgence in the late 19th and 20th centuries, brought on by the popularity of the Colonial Revival and Georgian Revival styles. Header: short side of the brick faces out. During Colonial times, the silver color of the headers occured on bricks placed close to the wall of the kiln. In effect, these were overbaked. Roman brick: brick having nominal dimensions of 4x2x12 in. (economy brick: 4x4x8 in.) Favored by Frank Lloyd Wright in his prairie homes. Rarely manufactured today. Rubbed (finish) brick: A finish obtained by using an abrasive to remove surface irregularities. Term also applies to stone. Brick rubbed with sandstone to produce a smoother surface of a lighter color was used esp. in colonial Virginia. 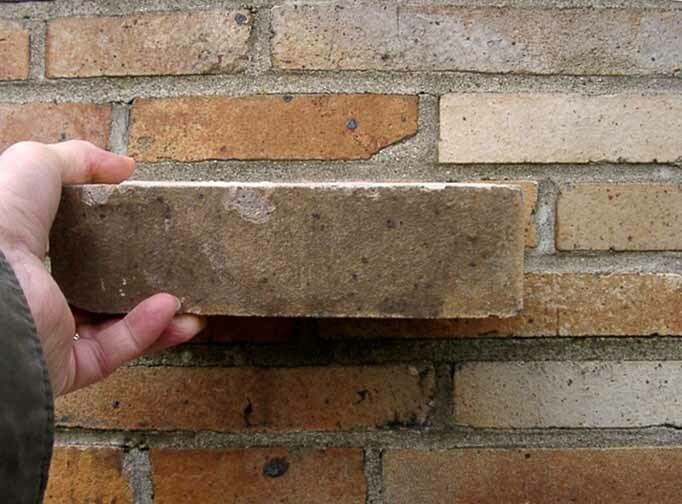 A rubbing brick is a silicon-carbide brick used to smooth and remove irregularities from surfaces of hardened concrete. In Niagara County on Townline and Beach Ridge Rds. Now a land fill. Large clay deposit. A wall of the Amherst Street Transit Station which was intended to be a work of art in its own right. The darker brown brick is used to represent the tree of life in the Bennett Apartments, an Art Deco design. A rich maroon brick is beautifully contrasted to white glazed terra cotta at Grover Cleveland H.S. Frank Lloyd Wright's famous Martin House, like most of his Prairie style buildings, uses Roman brick. Special thanks to Jerry Bastedo and John Opera supplying much of the information of this page.